Heat oven to 400°F. Generously grease 13x9-inch (3-quart) glass baking dish or pan. In 2-quart saucepan, heat water and butter to boiling. Reduce heat to low. Add baking mix all at once; stir vigorously about 1 minute or until mixture forms a ball. Remove from heat. With spoon, beat in eggs, 2 at a time, until dough is smooth and glossy after each addition. Spread in pan (do not spread up sides). Bake uncovered 30 to 35 minutes or until puffed and dry in center. Immediately after baking, spread pie filling over pancake. Cut into rectangles. Serve immediately. Spoon dollops of whipped cream on pancakes or sprinkle with powdered sugar. Top pancakes with sliced bananas and drizzle with caramel ice cream topping. 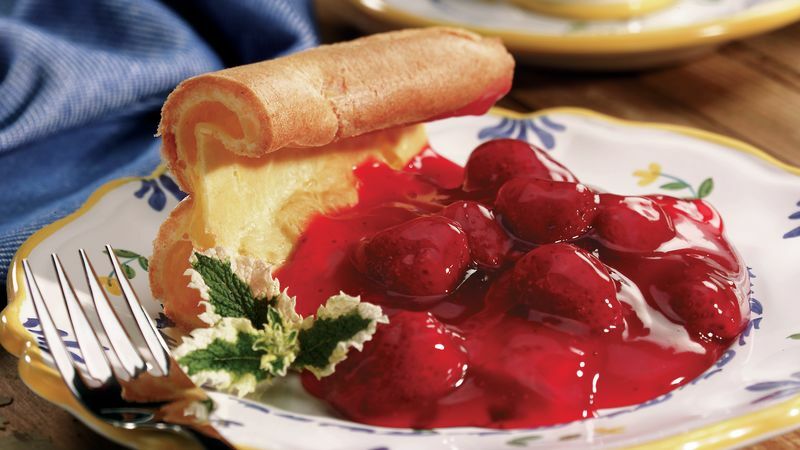 Use your favorite fruit pie filling instead of the strawberry.